Inspired by real animals, in photos emailed to her, Linda Quigley produces custom made acrylic paintings on gallery style canvas. Her style is realistic and detailed and these luxury goods make excellent gifts that are shipped all over the country. Some of her paintings are memorials produced to celebrate the life of an animal after they have passed. In Lewiston, Maine, at the age of 10, Linda received her first commission for a painting from her grandmother. It was an image of a baby bird resting in the hand of God. This early inspiration from her grandmother eventually led to the creation of Linda’s Pet Portraits in 1991. Linda has lived most of her life in New England but she recently moved to the dog welcoming State of California with her husband, two dogs and a cat. Linda earned a Bachelor of Arts degree and a certificate in Studio Art and has exhibited her art in Maine, New Hampshire and Southern California and painted several murals New Hampshire and Maine. Linda represents Linda’s Pet Portraits at several dog festivals, markets and benefits in Maine and Southern California. Linda exhibited a varied collection of nature inspired pieces at Sally and Henry’s Dog House Bar and Grill in San Diego, California. Her work is also displayed at VCA El Rancho Animal Hospital in Temecula and Camp Run a Mutt in Kearny Mesa. In addition to pets, Linda paints wild animals and a variety of nature inspired art, including Hawaiian inspired paintings on aluminum canvas, ocean scenes, beach houses and private homes. She works from photographs sent to her at clavette275@hotmail.com. 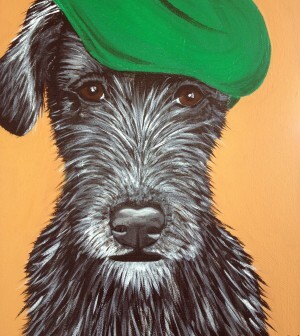 You can purchase a painting directly from her website, http://www.lindaspetportraits.com/.